All digital marketers want to increase content visibility. All brands want to increase awareness that leads to trust and conversions—the basics of the business marketing. The trick is finding a competitive and cost-effective way to amplify this brand content. 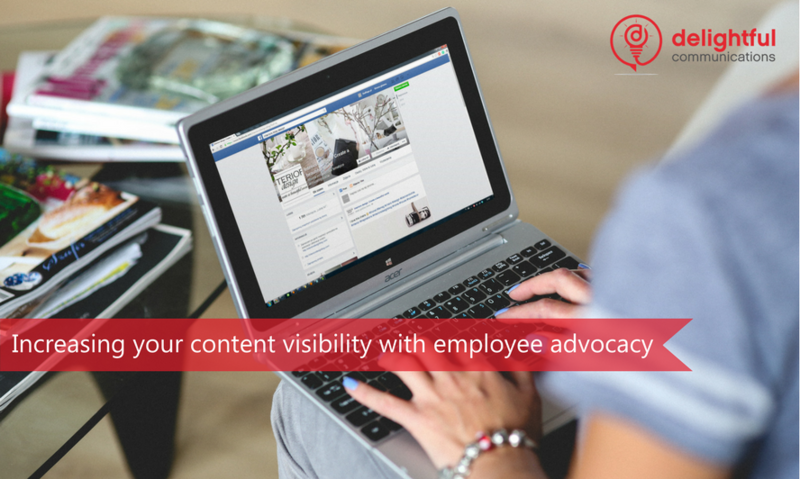 One of the ways to increase this visibility is with employee advocacy. It’s essentially free. People you already pay take a moment to share your new content, increasing visibility, and organic reach. And the commentary on this content is from experts too, as employees have the most detailed knowledge of your brand and its features. At Delightful, we believe that brilliant brands are built through people, not just pixels. Compared to branded messages, research shows that people’s words are more likely to be trusted. As one of our clients from Microsoft, Geoffrey Colon, the author of Disruptive Marketing: What Growth Hackers, Data Punks, and Other Hybrid Thinkers Can Teach Us About Navigating the New Normal, expressed in his recent LinkedIn article, brands will continue to be ignored while the influencers you pay may run into the same issues of all paid endorsements. It’s really time to pay attention to your employees who can be the most transparent, authentic, and trustworthy advocates for your brand. Do CEOs Get Digital Media? Here’s an Infographic That Tells You When They Do! Spotted this from Gal Borenstein on The Hub Comms where, ahem, I write an article every couple of weeks. Sums up a few of the ways I’ve been persuading CEOs and senior executives they need to be thinking. It pains me when I get pushback from exec comms people who say, “he or she just doesn’t have time”! We all make time to listen and learn and, in my opinion, industry leaders need to lead this understanding from the front. Relying on trusted advisors is ok for detail, but not understanding the general landscape or being oblivious to the latest trends in your industry is corporate suicide, when those trends change daily! Something told me when I set up Delightful Communications that I was onto something with helping CEOs with social media and personal branding. During my 12 years in digital marketing and my 9 year career in the entertainment business, one thing I’ve observed is just how badly some CEOs and senior business leaders conduct themselves online and onstage. Okay, so “badly” is probably too strong a word, so let’s say they leave a lot of opportunity begging as they and their PR teams miss many chances to really cement a positive image in the minds of their own staff, their customers AND their potential customers. Only last week, eMarketer talked about some Weber Shandwick research into the subject. We’re living in an age where digital feedback via social channels is rife and marketing and PR teams get that. What their not doing well is promoting one of their best and most public assets in an intelligent way. Next week I’m talking about Digital Evangelism at SearchFest in Portland, and I’ll be touching on the need for companies to have a face, a human face that customers can identify with and look for positive signals from and engage with. Digital and social media content across a myriad of devices has educated a much more savvy public as to what is PR spin and inauthenticity on the part of a CEO. They can smell it a mile off, and they will react badly if they get a whiff. What companies need to do is formulate a strategy around their leaders’ personal brand and open them out a little to the world. Some CEOs are not that gregarious, really busy running the business, and just not that into broadcasting their every thought and that’s OK. But they all have a story to tell, and they all have a duty to respond in some way in an authentic and honest manner to feedback whether good or bad. In 2013, that’s the sort of behaviour that gets your brand liked. That’s the sort of behaviour that get’s your brand talked about in a positive and endearing fashion. In a world where one Tweet can go more viral than anything ever before and say so much in a photo about that leader and his feelings & values, doesn’t it make sense that your business at least try and create a positive digital platform for your CEOs personal brand and that of the company? If you or your company leader is in need of a personal branding strategy please Contact Me…….before your competitor does! If you agree with this post or have a comment please share it and say your piece below!